Another match was added to the STRIKEFORCE: Houston event on August 21, at Toyota Center in Houston Texas. It's a fight between the undefeated heavyweight and two-time United States Olympic Games wrestling member, Daniel Cormier, and the hard htting Jason Riley. Mark the time and date, because the Toyota Center gates will open at 6:00 pm. 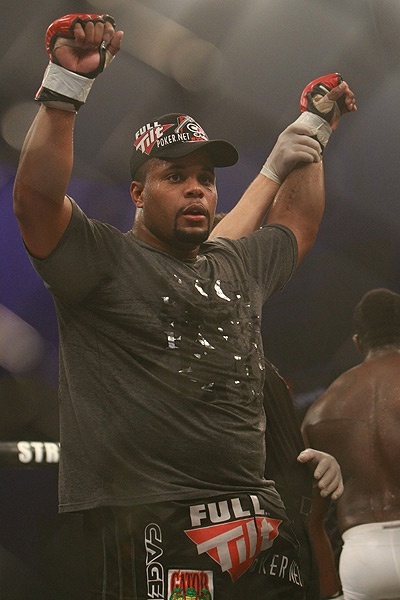 Daniel Cormier will attempt to make a 4-0 record when he faces John Riley in the undercard event of STRIKEFORCE: Houston on Saturday, August 21 at Toyota, Center in Houston, Texas. Due to additional heavyweight bout, the starting time was moved 30 minutes earlier than its original schedule of 7:00 pm (CT). Gates to the Toyota Center will open at 6:00 pm. Live Showtime telecast will start at 11:00 pm ET/PT with a little delay on West Coast. STRIKEFORCE’s main event will feature “King” Mo Lawal as he defends his World Light Heavyweight championship belt, against Rafael “Feijao” Cavalcante. The co-main event is a match between Ronalds “Jacare” Souza and Tim Kennedy, for the vacant STRIKEFORCE Middleweight title. The televised bout will feature the return of former WWE personality Bobby Lashley against Chad Griggs. Also on the televised portion,is the fight between KJ Noons and Jorge Gurgel for the lightweight division bout. Daniel Cormier (3-0) is a former NCAA Division I runner up at the Oklahoma State University. He has won all of his three professional MMA bouts via knockout. He won his first MMA and STRIKEFORCE with a second round TKO punches against Gary Frazier. John Riley (7-3) has won four of his seven fights via knock out. He is looking for a rebound from a KO loss to Devin Cole.